Outdoor benches generate a space that fosters community interaction while enriching landscapes and experiences. The precision styling of the 7' Basic Flat Concrete Bench invites everyone to sit, relax and enjoy the natural moments of the day. 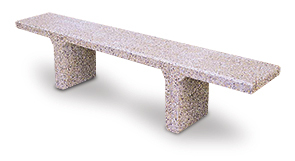 Constructed with solid precast concrete reinforced with steel rebar—this bench is ready to provide a sturdy, welcoming space for many years to come.